This web page documents a plethora of smaller designs and hacks, some (ok almost all) with no commercial use, just for fun. There's a lot of stuff to document. They'll be more here as time and inspiration strikes. Ya should see the pile of old circuit boards from old projects I've got in a bin. Midi-controlled EL wire controller with dimming! 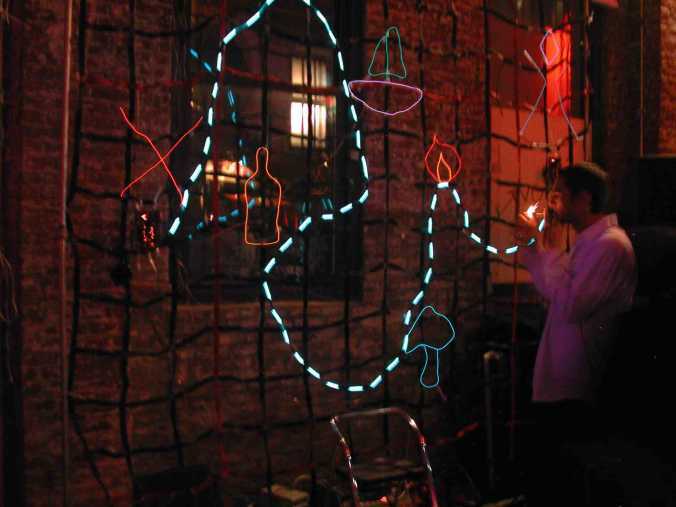 EL wire is great stuff; flexible, cool to the touch, glows in pretty colors. I first saw it at Burningman in 1999. I knew what I wanted to create: a MIDI controllable EL wire sequencer. 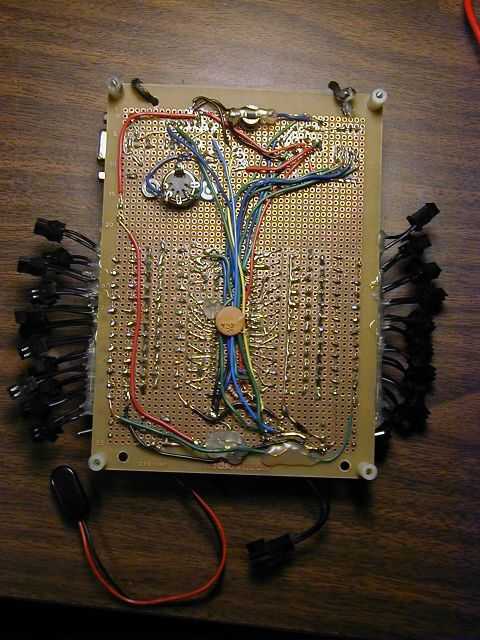 This was well before sequencer kits were available, and it was a royal PITA to work with the stuff, etc. Yep I was like way hip back then. Ok on to the technology. 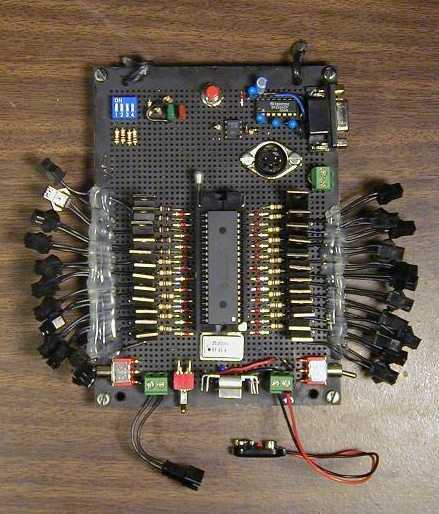 I was just getting into microcontrollers again after several years, and PIC seemed to be all the rage. The first thing was to figure out how to control it electronically. 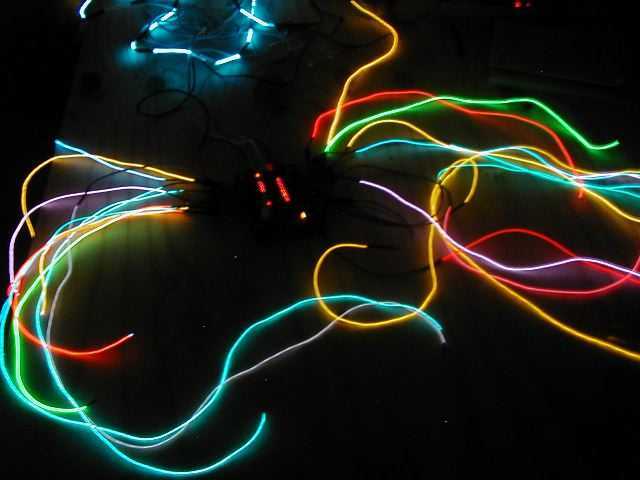 EL wire uses an "inverter" to generate around 180V pseudo-AC (at 1Khz or more) from a DC supply; is the the electric field the AC creates that charges up the electroluminescent material in the "wire" that glows. So, to control the "wire", you've gotta control this >1Khz, 180V pseudo-AC. Just the thing for a beefy-ish triac. 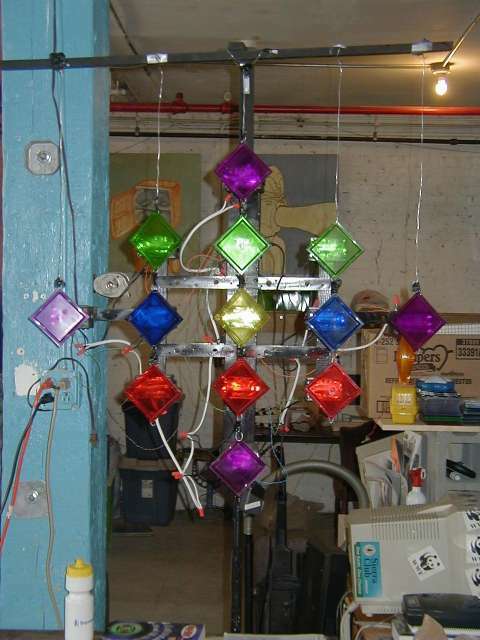 Triacs are designed to control AC power, but they work fine with this EL wire "AC". And, for bonus points, I added some simple dimming control, whereby the triac is turned on and off rapidly in a PWM manner to give the illusion of dimmer wire. However the way I did this was simple (no zero-crossing detector) so there are only 8? 10? levels of dimming (I forget). 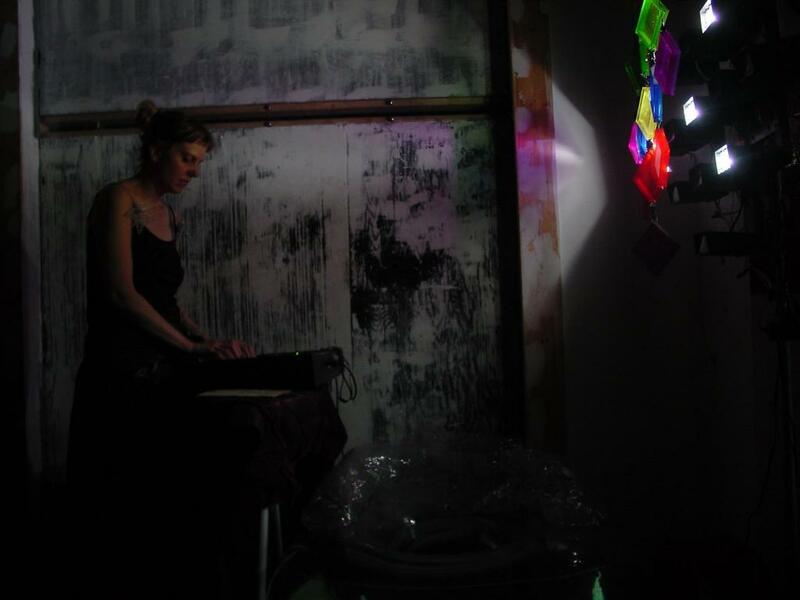 The MIDI velocity was mapped into the dimming levels. The board controls 24 strands of EL connected thru these handy connectors Coolight has (or had; this was 5 years ago). The board had a DIP switch to set various test modes and RS-232 input as well. To help with debugging, each of the 24 outputs had a little LED to show when it was on. So we've got MIDI message recieve parsing & 24 channels of PWM on a PIC16F877 all written in assembler! No schematic, and no board layout, this was prior to purchasing Eagle. But if you'd like to look at the code... its here. 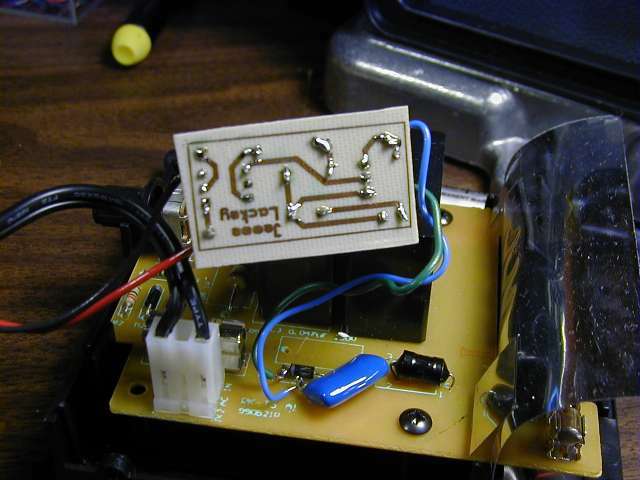 It took about 30 hours to hand-solder the board in perfboard. And, I built two of them! Crazy kid! What was nice about the whole design is that since it is MIDI controlled, one could "play" it with a MIDI keyboard, and if the keyboard was velocity-sensitive, the harder you hit a key, the brighter the wire for that key glowed. And it was sequencable by any midi sequencer; I used my laptop (RIP...) to run it at parties. Because of the modular connectors, I could put different colors / lengths of wire on each output as needed. And if that wasn't enough, by getting some 3/4" metal pipe and various right-angle and straight joins, I could screw together a frame to hold a cargo net that I then used to hold the EL in whatever shape. Portable(ish) and fully customizable. Action photos below. 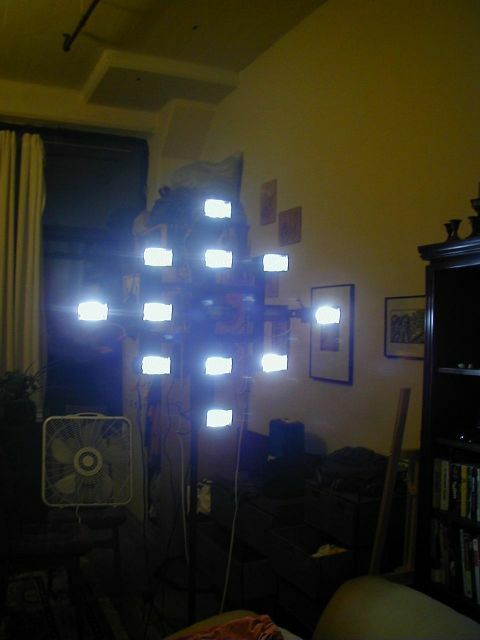 Midi controlled strobe light sculpture! This project was born out of some research done (my very first client EE project!) for Leo Villareal. 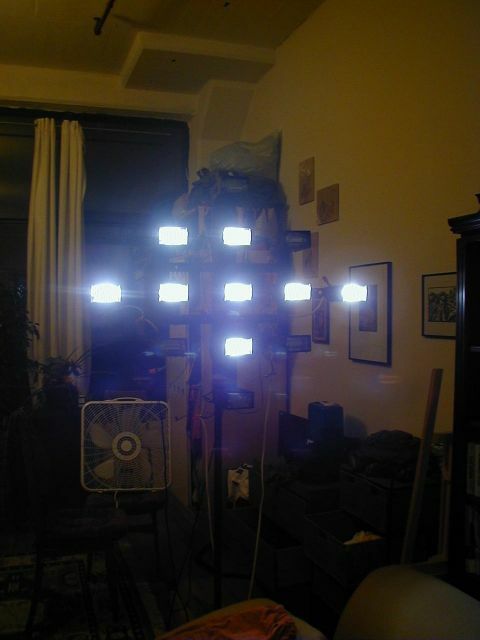 He was trying to find a way to put 640 computer-controlled strobe lights on the side of a building; he'd been using these $20 generic cheapies for other projects, but we needed precise triggering so patterns of flashes could be played out in the installation. Due to the fact that these would have required $60,000 worth of union-installed AC in conduit, low-voltage LED "strobe lights" were eventually used instead. (Picture here). Well the investigation was a success, in that precise control could be attained by hacking these strobe lights. So, I built my own little $100 creation. It takes Midi in from a keyboard, and the lower half of the keyboard makes one of the 13 strobes flash just once per keypress, and the upper half of the keyboard makes them flash full speed for as long as the key is held down. You can press a single key to all thirteen, and flash flash they go. I bought some colored plasic boxes from one of those places on Canal St. (manhattan) and created a hanging thing with just the tops as "gels" to make it colorful. And, the keyboard of course makes sounds too. So we got tactile to sound & flashing bright colored lights that go clack clack clack as they fire! (since they are real xenon and stuff.). Party fun! Party action! By pressing different key combinations (like visual "chords") one can make different color patterns and shapes. Ok, in order to keep the size of this webpage down image-wise I'll put the rest as links. The way the hack works is to to hold off the trigger coil in the strobe light from charging. 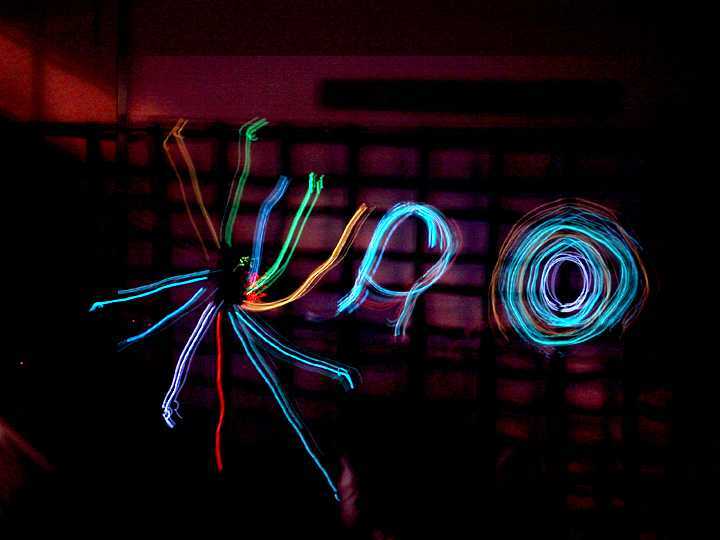 This is done by a garden-variety opto-isolated triac. The timing of how long the turn on the triac is somewhat critical; too short, and sometimes you don't get a flash. Too long and sometimes you get a double-flash. I tweaked it so that one gets a single flash at least 99% of the time. Pic of that board is here. 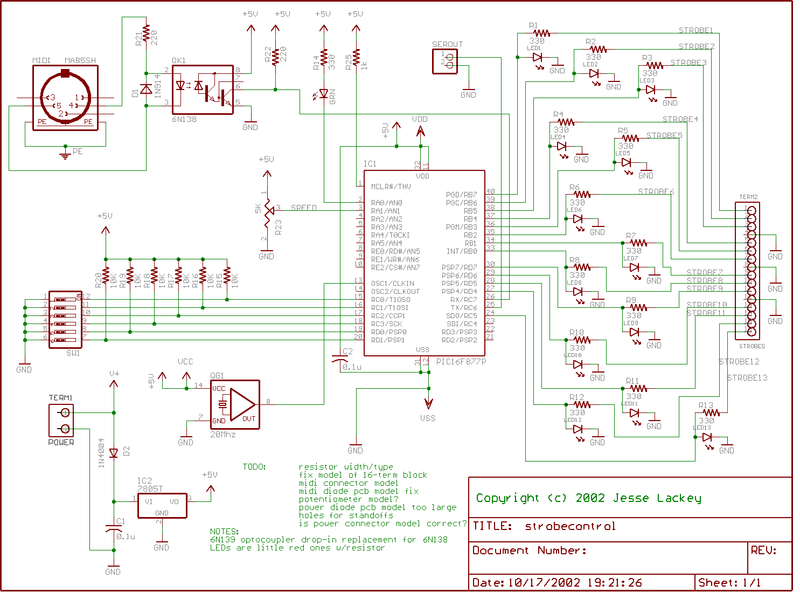 Sorry I don't have a schematic. 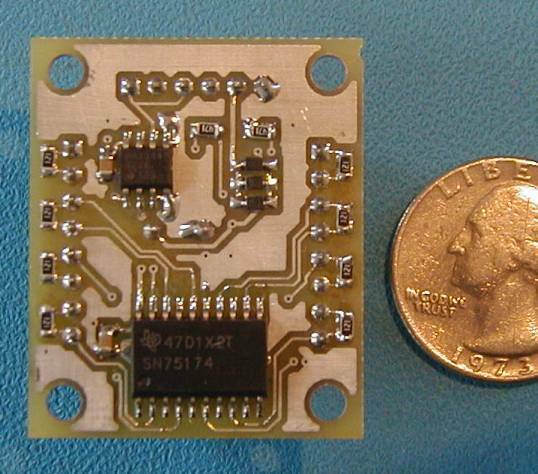 World's smallest 8-output dmx/RS-485 "fanout" board! Sometimes size really does matter. In this case, what was needed was a way to "split" a DMX signal to feed 8 separate sets of 16? 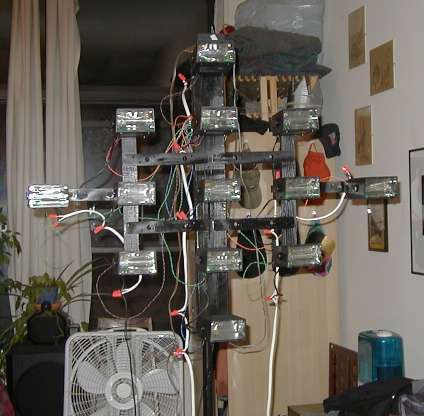 DMX inputs wired in parallel. No big deal, but it had to go inside a smallish box, that was sized to be hidden by the infrastructure in a large LED installation. Inside this box was a super-beefy 5V power supply running... 64 I think it was LED "strobe lights", check it out here: video. Anyway, so there was no space, and the 5V was extremely dirty, since it was going from heavily loaded to virtually nothing rapidly and constantly. So, what to do? Well, I looked around for 3.3V RS-485 parts. There are some, but no multi-output ones, at least not at the time. Designing a DC/DC to boost from dirty 5V to 7V and then LDO it to get a clean 5V was a possibility but... it would take up more space and be a considerable number of parts. So I did a little trick. 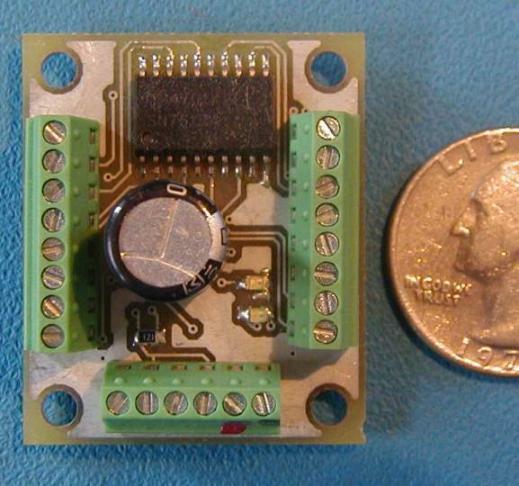 Take your dirty 5V, put it thru a diode to a big cap. Now you have a "peak detector" power supply. The cap charges to ~4.75V (5V minus the Vf of the diode) when the load is light. When the load goes way up and the supply sags a little, no problem - the diode prevents the cap from discharging to the no-longer-5V supply. To get the lowest Vf, I took three diodes with particularly good Vf and put 'em in parallel. So the supply is a fairly clean 4.75V, thereabouts. 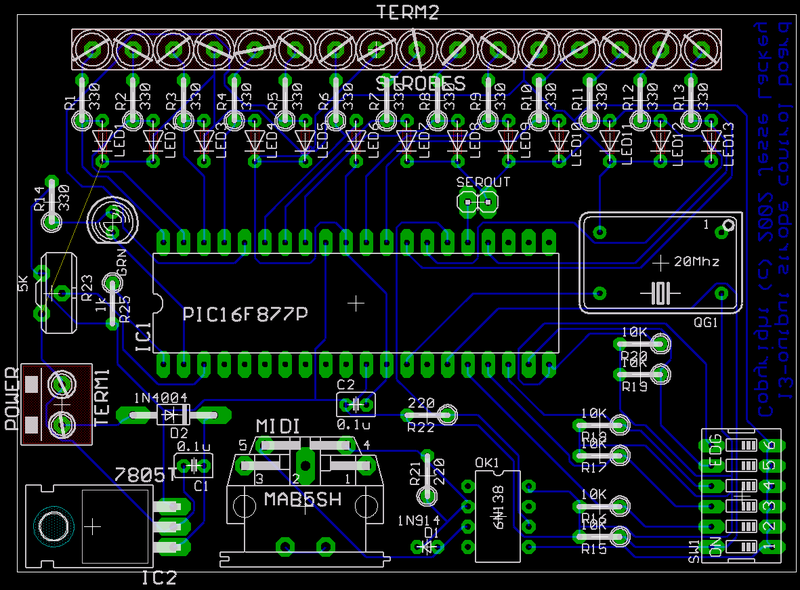 This is within spec for 5V RS-485 parts. There were... 4? of these? 6? I forget. Anyway its been running for years. There's even a little power-good LED and "fault" LED if the RS-485 is backwards or one or both lines are shorted or open, to help stressed-out wire-installers (racing to finish it all before the gala opening) debug any problems.